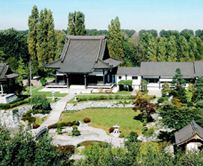 EKŌ-Haus der Japanischen Kultur e.V. organises many events and programmes all the year round. Please visit German and Japanese pages for the details. 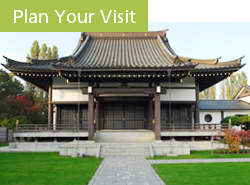 The EKŌ center offers guided tours for groups and individuals through the EKŌ temple, the Japanese house and gardens. 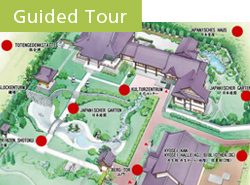 Here you find information on events taking place in the EKŌ center like exhibitions, lectures and courses on Japanese culture. 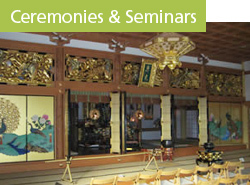 All Buddhist events and ceremonies are open to the public. Everybody is cordially invited to participate. Here you find information on location, address, access, entrance fees etc. 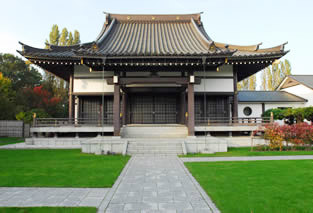 In 1993 in Niederkassel, a suburb of Düsseldorf, a Japanese cultural centre was opened: the EKÔ-House. The foundation stone had been laid in 1988 by Yehan Numata, the founder of the Mitutyo Society and of the "Society for Buddhist Understanding". As a city whose Japanese presence is among the largest in Europe , the choice of Düsseldorf as location for the cultural centre was no accident. With the centre, Japanese living in the region are in the rare situation of being able to practice and cultivate the familiar customs of their own culture. But also, the people of the region, with a very different cultural background, have thereby the unique opportunity of learning about these customs, and to themselves participate in them. 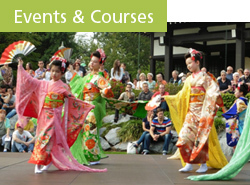 The events offered include: the celebration of Buddhist festivals, tea ceremonies, garden fêtes with musical or theatrical performances, music events, reading and working circles for fundamental Buddhist texts, exhibitions, introductory courses in traditional Japanese arts (such as brush painting, calligraphy, Ikebana, instrumental music, dancing and cooking), lectures and lecture series, film presentations, and discussion circles on current themes.